We have conducted research in an attempt to understand why the accounting function of a Swiss public administration has significantly changed following the implementation of an ERP system. To study this social phenomenon, an ethnography research strategy was followed. This approach is well suited for situations facing deep structural changes such as the transformation of a profession. The sample consisted primarily of accountants, accounting managers, and related professions. We have structured the analysis around the 3 following axes: 1. organizational structure changes, 2. standardization and centralization processes, and 3. centralization’s effect on accounting tasks. Research findings and analyses indicate that the power of each public administration department under review is very strong to the point that it has negatively impacted the necessary standardization imposed by an ERP system implementation. So, the full potential of the ERP is not exploited at all. However, the financial statements can now comply with international standards such as International Public Sector Accounting Standards (IPSAS). Consequently, our case study shows that an ERP implementation project cannot be managed in the same manner as those realized in the private sector. Due to the new IT in general and to ERP in particular, the organizational changes are very well described in the literature. Authors agree that the ERP systems impose “generic processes” and are supposed to provide the business with “best practices” (Davenport, 1998, p. 123-125). Moreover, academic research points out that some ERP’s characteristics, such as the integration of business processes and data, standardization of work, and centralization of internal services allowed the transformation of the management accounting function (Scapens & Jazayeri, 2003). Information technology and organizational changes seem to be the two most important change drivers in management accounting practices (Yazdifar & Tsamenyi, 2005). The impact of ERP system implementation on employees’ work in general (Kumar et al., 2002; Arnold, 2006), and on accountants’ tasks in particular (Burns & Vaivio, 2001), is also largely described. The public sector is also very well studied by academic researchers. A recent study by Rosacker and Olson (2008) indicates that IT investments increased, and predicted IT’s expenses for state and local governments (in the USA) would be around USD 72 billion by 2011. It is generally acknowledged that the public sector is considered to be a very promising market for IT development. Indeed, several studies have advocated that the public sector must face great challenges and reforms. The public sector has to modernize its way of serving citizens and improving accounting transparency. ERP system implementation is a way to address these challenges (Deloitte, 2006; Cacciaguidi-Fahy et al., 2002). Despite the fact that ERPs in the public sector are also largely studied (Chang, 2000; Gulledge & Sommer; 2003, Wagner & Lederer; 2004, Raymond et al., 2005; Rosacker & Olson, 2008) the evolution of the accounting function following ERP implementation is, to our knowledge, not addressed in research. Consequently, the aim of this chapter is to examine the impact of ERP implementation on accounting service organizations. The research question of this study is to determine how the accounting and finance professional functions change when implementing an Integrated Financial System (i.e. the finance modules of an ERP system). This chapter is organized as follows: The Literature Review section inventories research findings related to ERP implementation’s impact on an organization as well as on employee tasks. The Research Design section presents the ethno-methodology approach that was employed in our study to investigate the ERP impact on the accounting function in a public administration. 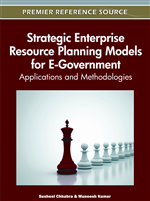 The Case Study section details the context of the ERP implementation in a Swiss public administration. The Results and Discussion section provides a synthesis of our fieldwork as well as the concluding remarks.